We really spent most of our time in Auckland outside of the city in the surrounding area and on the islands. This also meant that we took snacks with us everywhere we went since we didn't know what, if any, safe places to eat we would find. I ate here, a couple of times, when I stayed in Auckland in 2005 and I recalled some of the best fisherman's chowder I had ever had. 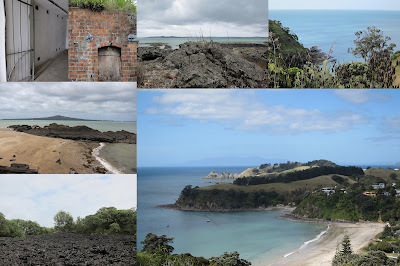 So we decided to walk into Devonport and see if it still existed. Luckily for us the Patriot was still alive and well and their chef was able to guide us toward gluten free choices on the menu. 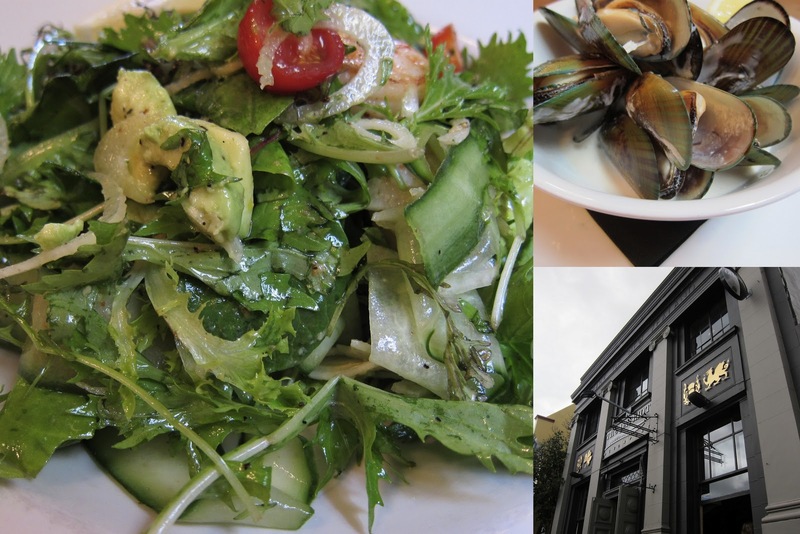 I ended up with a wonderful salad and plate of green lip mussels. 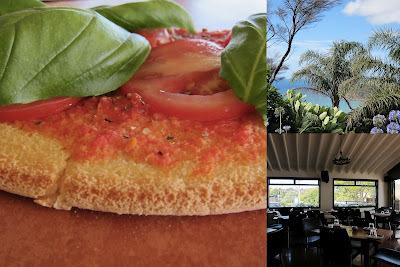 In my research, I actually came across a couple of places on the island that seemed to be gluten free friendly probably due to their use of local and organic ingredients. But at this point in the trip I was craving pizza, so we tried out Stefano's which offered a gluten free base for all of their pizzas. The basil and tomato that you see in the picture above were amazingly fresh and delicious. Even though Marx Bakery had a website, I was really worried that we were on another wild goose chase when we headed towards St. Heliers from the main part of the city. To my surprise though we found a good gluten free and mostly dairy free bakery to stock up on treats. 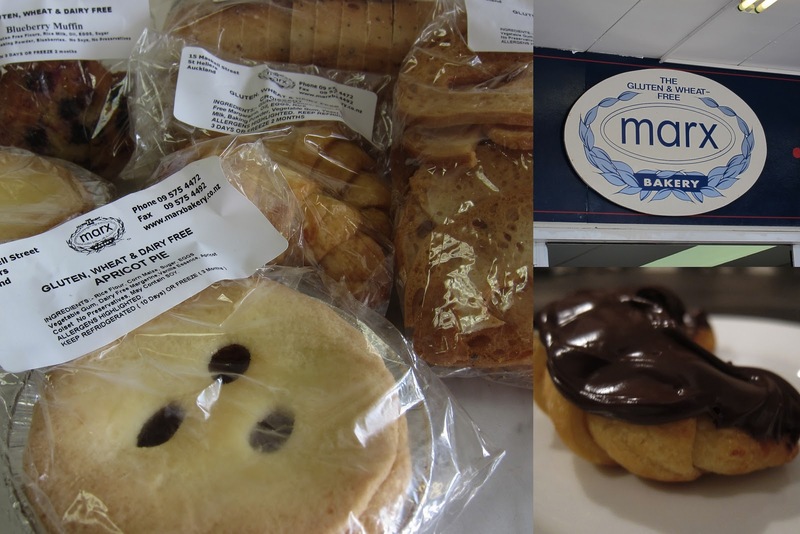 I think the best two items that we bought were the mini apricot pie and the bagel chips. On a total side note, I noticed that in New Zealand, every organic or speciality store that we visited seemed to sell pre-rolled gluten free pastry. I am so so so envious of this, I really wish we had this in the states. I miss the ease of buying that pre-rolled sheets of puff pastry to wrap around cocktail franks or veggie dogs for a quick appetizer for a crowd. Sigh. Maybe someday or I might have to break down and try to make my own.